A rich colony sim that doesn't quite reach the stars. What is it? A life management sim that generates character-driven stories. This review originally ran in PC Gamer UK issue 326 in December 2018. The best games are masters of illusion, making you believe a bunch of code and scripted behaviours are somehow real worlds or great stories. Even a game that's explicitly driven by values and numbers, abstract in its presentation, has to convince you that what you're watching unfold is an organic ecosystem. RimWorld aims to create complex drama from its systems, but as close as it sometimes gets, the illusion never quite takes hold. 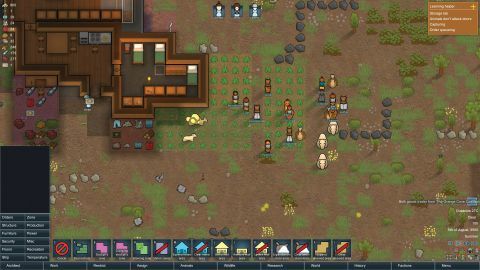 RimWorld is a game about establishing a colony on a remote planet sometime in the distant future. There's a whole Western vibe, resulting in a sort of Firefly-esque setting. It's a life simulator, a genre about a more hand-off approach to strategy and management, where you manipulate AI behaviour instead of controlling it directly. RimWorld sits somewhere between The Sims and Dungeon Keeper, though its presentation and style are reminiscent of games like Prison Architect. It's a story generator, promising to co-author all manner of wild tales for players. This isn't about creating the perfect colony, this is about creating drama. This means things going wrong, that the unexpected has to occur and that your characters have complicated motivations. They're given drives and needs, ones that are often extremely unhelpful to the mission but which are intended to make them more complex and rounded. Go in wanting to build a perfect little colony and you'll likely be frustrated. Accept the game's penchant for disaster and you'll have a much better time. Improve your experience of the game with these. A vastly better way to manage the gear of your colonists. Essential, showing colonist interactions on-screen as they happen. Mostly cosmetic but helpful to make a colony feel more like a home. Stops in-fighting leading to fatal outcomes, if you want more sensible colonists. It's your colonists that are the main drive behind the game. When you begin a scenario you have to select your team (or individual, if you're going for the harder challenge) and they'll be generated with a load of traits and backgrounds. Some are helpful skills, like hunting or teaching, and some of which are simply there to inject personality—flaws and all. Old wounds, traumatic upbringings and bad attitudes… specific qualities to make sure your colonists are far from perfect little worker bees. There's a lot of promise in the ideas these characters bring to the table. In my first game, I had a colonist who, chronologically, was 114 years old, but, thanks to the weird complications of space travel, was really only 24. The son she'd left behind was now approaching his fifties. His daughter, her granddaughter, was now 31. RimWorld pitches itself as a story generator and these weird relationships are exactly the thing that fires up the imagination. While the system gives you vivid images of characters like the ruthless bounty hunter who’s lazy and a vegetarian, in the end, they all interact in slight variations of the same way. They don’t speak, in text or otherwise, and so the facets of their identity are declared in a character sheet that's fed to you through a drip feed of tiny updates. “John talked about hunting with Bob”. It’s hardly stirring stuff and does nothing to make your colonists feel like much more than worker drones. It points to the main issue with the game's approach to character, which is to treat people as the sum of a few parts. It's not unreasonable that a game of this scale needs to have a simple system to generate its characters, and the end result is that while you have AI that behaves in interesting ways, they never quite feel like real people. As long as you're able to look past that and just enjoy the odd behaviour of these robotic colonists, there's fun to be had with RimWorld's unique sandbox. Once you're down on the ground it's all a matter of laying out tasks for your colonists. You don't get to take control so must instead lay down blueprints and zones, stack up tasks for them to complete. The UI is a bit lacking to be honest. It's fine after enough time but far from intuitive and full of irksome inconsistencies like being being able to mass select some objects but not others. Going through an entire field of potato plants to order each of them to be harvested is the kind of busy work that feels needless. This is largely the boring bit. The real fun stuff happens once you've got a competent colony running and can begin to watch your colonists deal with all manner of scenarios, building relationships with each other and then falling out. Rivalries develop, in-fighting can happen and that's all before you take into account all the external factors. External factors like a random faction sending a hunter to my colony with apparently the sole purpose of murdering my dog (naturally, we had him shot on sight). The longer you survive, the more bizarre the events become. Mind-controlling drones and mythical beasts all show up, to steer your little colony in radical new directions. RimWorld thrives when it's at its most unpredictable, never letting you get too comfortable. To manage all this potential chaos though is an AI storyteller, similar to the Director in Left 4 Dead, that analyses your game and, based on how things are proceeding, it conjures up suitable events. There are three storytellers to choose from with varying difficulty levels, so you can tailor the game to the kind of story you want to have. This ranges from a completely laid back experience where dangerous events scarcely occur, all the way up to a whirlwind of terror that never ends. While obviously you'll want to start on the milder end of the spectrum, it won't be long before you'll want a scenario where events happen at a much more rapid rate because in RimWorld, there is a lot of busy work. Waiting for your colonists to build or explore is what the vast majority of your time with the game amounts to, especially in the early hours. You'll have the game on fast forward as much as you can just to get through the tedium of each day. Things become more complex and varied the longer a colony survives, but even still, so much waiting around occurs. In that dullness, you can't help but begin to see the gears and cogs in the machine. Interesting things happen, but when the characters themselves already feel so artificial they rarely take on the life required to make me believe in the stories unfolding. I'm not watching a drama, but the chaos of a petri dish. Which isn't to say RimWorld doesn't have its moments or there isn't fun in its attempt to tell engaging stories, but it doesn't entirely live up to its promise.